Have you ever noticed that although the days of summer are longer, it seems there is so much packed into the days that there still isn't enough hours of sunlight for everything? It seems that I am all too often wishing that I had more hours in the day to get everything done - so this summer I have vowed to make our family's meals quick to cook and easy to prep to help alleviate that feeling. We need more time for running through sprinklers, exploring bugs in plants and creating chalk mosaics on sidewalks - those are the things that summers are made out of! My kids love chicken nuggets. I am talking L-O-V-E. 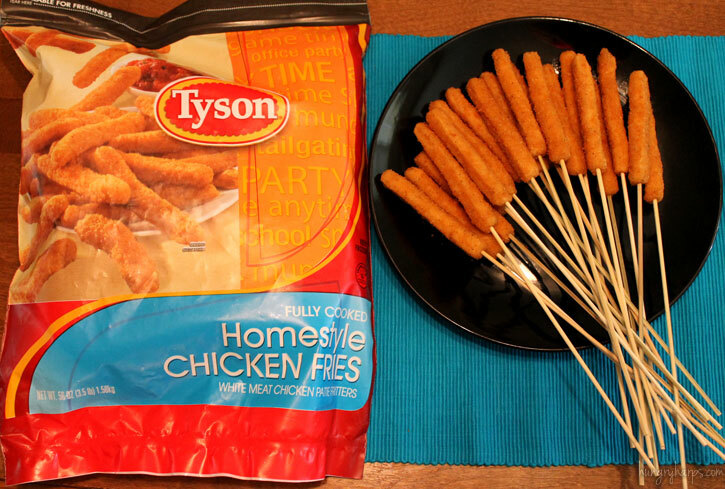 So when I saw Tyson Homestyle Chicken Fries, I knew my kids would go crazy for them. They are basically chicken nuggets in the shape of fries. Not only are they perfect for little fingers to grab and for dipping, they are also a quick chicken dinner - which is what I am aiming for these next few months. 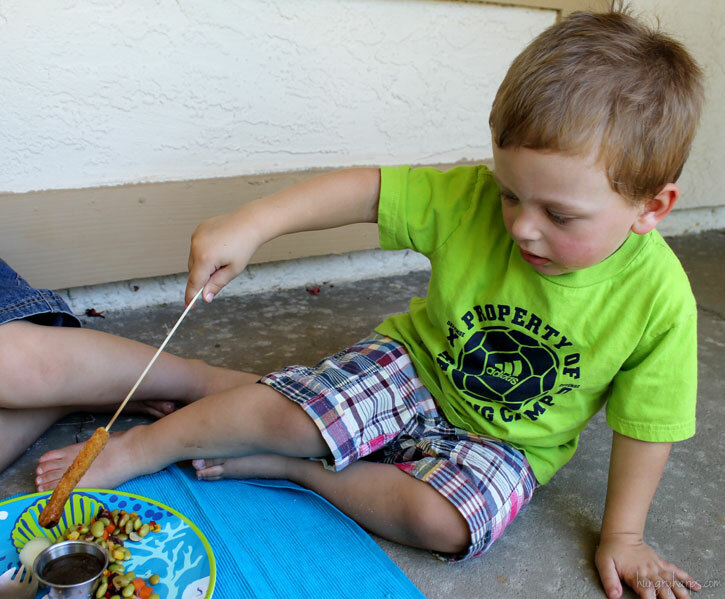 Since we spend most of our summer evenings outside, next to the fire pit, I decided to skewer up the Chicken Fries and let the kids have at cooking their own dinner. 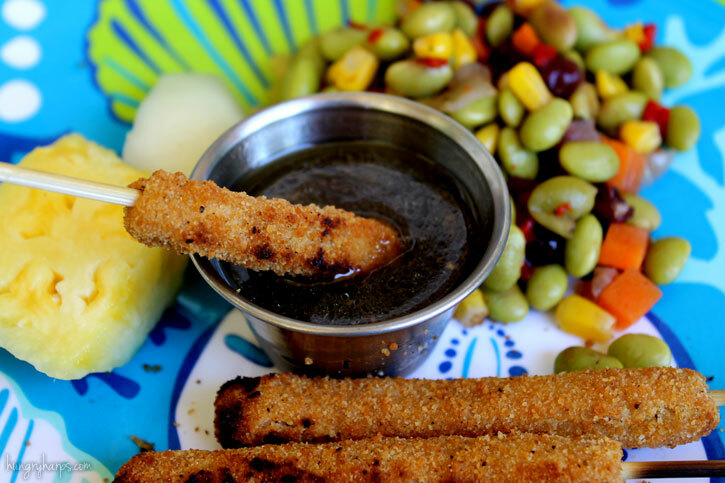 The Chicken Fries are fully-cooked, so no need to fret about the kiddos getting salmonella. 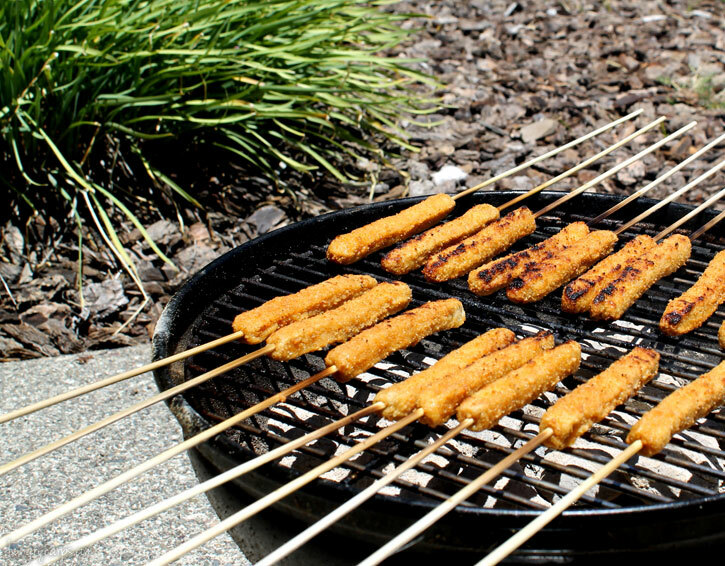 Skewering the chicken was so easy; just let the Chicken Fries defrost and insert skewers. I put them in the fridge, on a plate, until we were ready to heat them up over open fire. I also made a dipping sauce for the kids to dip their Chicken Fry Skewers in, an easy-to-make sauce that doesn't require the food processor. The Smoky Citrus Dipping Sauce screams summertime to me - from the in-season citrus fruits used to the smoky flavor that reminds me of BBQ'ing. 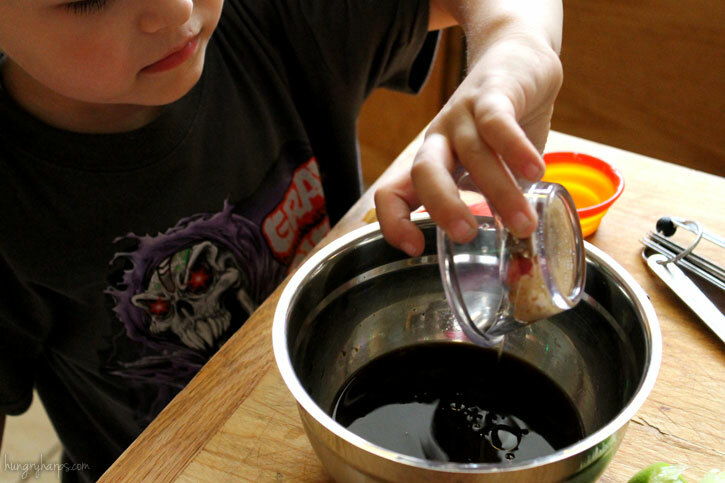 Soy sauce and sesame oil are also included, giving the sauce an Asian flair. Delicious!! 1. 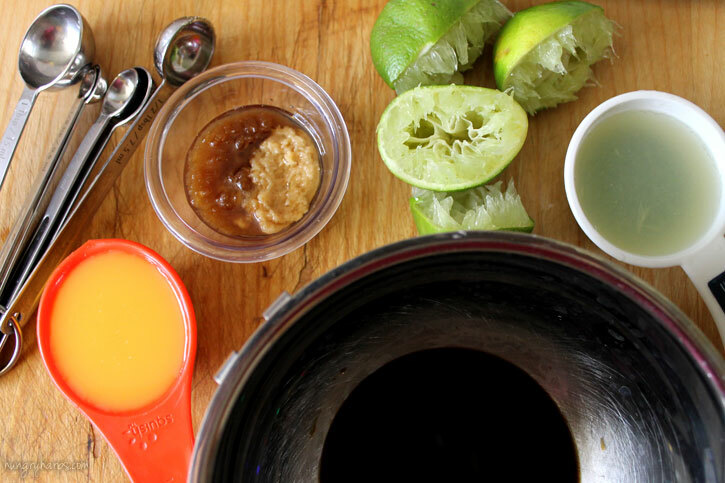 Whisk all ingredients together, chill for at least 20 minutes before serving. I measured out the ingredients and had Bubba mix them all together. He is not always interested in helping out in the kitchen, but when he is - I am all about it!! At the tender age of 4 he has already mastered cracking eggs and using the can opener, two things that still make me hold my breath every time he does them. After I skewered up the Chicken Fries and Bubba helped make the Smoky Citrus Dipping Sauce - the boys took to the outdoors. These kids are insane when it comes to playing outside - they do not care that it is over 100 degrees with no breeze, if it's time to play - it's time to play! One thing I have noticed about when they play hard in the summertime is that they will eat like teenagers when they are done playing. Yes, my 2 & 4 year old will eat like ravenous beasts before hitting the shower and crashing down for the night. It amazes me every time. The Chicken Fry Skewers took hardly any time to heat up - about 5 minutes total. These would be great for a quick appetizer to a grilled meal due to their fast heat time. 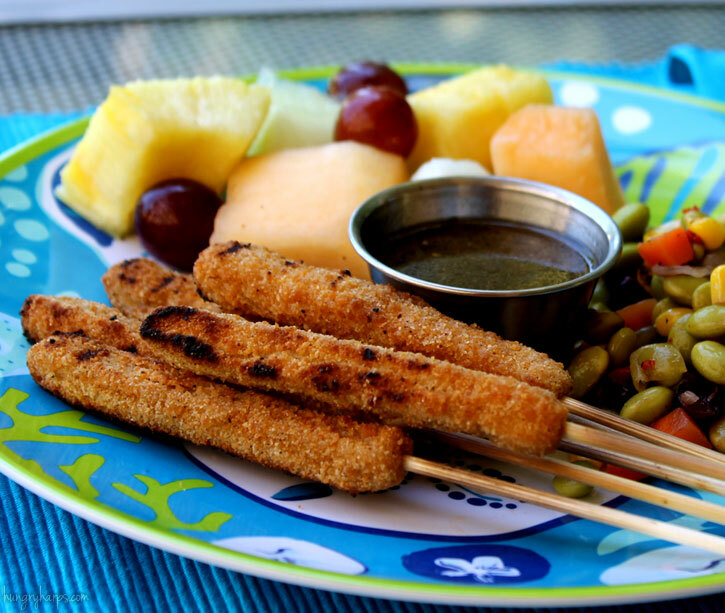 I served the skewers and dipping sauce alongside fresh fruit and an all-natural Edamame Salad - both of which I found at Sam's Club. I posted my shopping trip on Google+, if you want to check out my shopping journey! And let's be honest - how awesome is the novelty of having Chicken Fries on skewers? For more information on Tyson Homestyle Chicken Fries, check out Tyson's website at http://www.tyson.com. 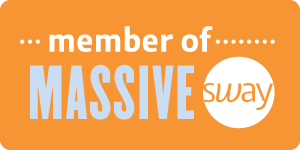 They also have a twitter account to follow and a facebook page to LIKE. Soon, on Tyson's Facebook Page, you will be able to enter for a chance to win free Sixs Flag tickets for a family vacation. Now that sounds like fun!